The human body is equipped with a remarkable alert system. When something is not quite right inside your body, it will manifest itself externally. It’s the body’s equivalent of a fire alarm. This is especially true when it comes to the health of your fingernails. The appearance and quality of your nails are important indicators of your bone health. And when you know what to look for, they can give you clues to help you determine the state of your bone health. Now this is hardly a scientific test, so it’s obviously not 100% reliable. The funny thing is that the official bone density tests are unreliable too. It’s just that no one mentions that to you. There are so many factors that play into the bone density test that you really have to take your results with a grain of salt. But that’s not what you’re told. Instead, you end up scared to death when you go in to get your results. No one gives you the information you need to meet the fear, see it for what it is (usually a lack of information), and get on with your life. My own nails have improved tremendously when I tested the Osteoporosis Reversal Program on myself (yes, I was my own guinea pig). It was just one of the many fringe benefits of the program, besides getting rid of osteoporosis. They’re so strong that I have a difficult time cutting them! I prefer to keep my nails short because long nails interfere with my computer use. Now let me show you how your nails are a “window” into your bone health and how you also can have strong and healthy looking nails. This technique isn’t new. For many years, long before equipment was used for medical diagnosis, it was known that fingernails could provide good clues to a person’s overall health. As I write in the Osteoporosis Reversal Program, there are two direct indicators of possible bone loss that can be observed in fingernails. These appear on one or more of the fingernails, and the nails begin to split along the white lines. Vertical white lines on the nails are commonly associated with a shortage of calcium within the body. The fingernails become brittle. They split or break easily, and their color turns to a pale white. If your nails show either one of these characteristics, and especially if you have both, I recommend you get started on a natural osteoporosis treatment protocol right away. Besides increasing your bone density and tensile strength, the Osteoporosis Reversal Program will help you retain the maximum amount of calcium in your bones. And your nails will become healthy, strong and beautiful fast – amazingly, you’ll notice your nails getting stronger within 48 hours of starting the Osteoporosis Reversal Program. What Else Are Your Nails Saying? Your nails have a lot more to say about your health. Fragile nails with horizontal and vertical ridges can indicate a Vitamin B deficiency. Rounded or curved nail ends, or excessively dry nails, can indicate a deficiency of Vitamin B12. Fungus under or around the nails can indicate a lack of the “friendly” bacteria in the gut our systems need. Spoon-shaped nails (where the nail end curves up) can indicate a lack of iron. White spots can indicate a zinc deficiency (but if they’re just on a nail or two, it’s more likely to be the result of minor trauma – it could be a minor blow that you don’t even remember). Dry, brittle nails can be an indication of lack of calcium. They can also indicate a lack of proper hydration. Pale, very white nails are a potential indicator of anemia. Frequent hangnails could mean a lack of sufficient Vitamin C, folic acid and/or protein. It is of course important not to jump to conclusions based simply on the appearance of your nails. Nail issues, including all of those listed above, can have many causes and should be checked out by a health practitioner. Nails: The Future of an Osteoporosis Diagnosis? Here’s some news about a discovery that could change the way osteoporosis is diagnosed, making DXA (previously DEXA) scans obsolete. It would also be quicker, safer, and potentially much less expensive. Dr. Mark Towler, a researcher at the University of Limerick in Ireland, found that disulphide bond levels (which are instrumental in binding protein molecules to each other) are lower in people who have been diagnosed with osteoporosis. He discovered that testing the disulphide bonds in fingernails could be an accurate way to assess bone health. Crescent Diagnostics, which was set up by Dr. Towler, conducted further clinical studies using the Bone Quality Test device (BQT), which assesses disulphide bond levels through a simple fingernail scan. So far, it appears that the results are at least as accurate as DXA technology. This method could even be used with fingernail clippings, so it would be possible to send your nails into a lab for testing and avoid the radiation exposure of DXA scans. The BQT device is not yet available. Patents are in the works, indicating that there are helpful and exciting developments on the horizon. For now, pay special attention to brittle nails and/or white vertical lines I mentioned earlier. Fear from a lack of understanding is no better. Both are unnecessary. The Osteoporosis Reversal Program can help you end that fear. Because it spells out, in plain English, what you’ll never hear from your doctor about dealing with bone health the safe way. Your fingernails are a reflection of your bone health because they give you visible warning signs about the condition of your bones. It also means that you’ll have equally visible proof of your progress. If you’re scared about the future of your bone health, get started with the program today. Relief is available right now. I look forward to hearing about your newly regained bone health reflected in your strong and beautiful nails, as you follow the Osteoporosis Reversal Program. I have developed osteoporosis in both radius and femur over the past 4-5 years. I believe that a malfunction of my aldosterone hormone in the adrenal gland had a big part to play, because my minerals were not being absorbed. This malfunction was caused by a subtle and insidious intolerance to all herbs of the daisy family. I thought that I was choosing healthy food when I ate lettuce, dandelion, sunflower, chamomile, stevia and arnica, but in fact I was making myself sicker. But wait, there’s more. For the past 4-5 years I have also had very cold legs inside, even in extremely hot weather. No-one has been able to come up with an answer. Could this be related to loss of bone mass in my femurs? I’ve noticed my nails are much stronger, to the point of being irritating because they are so tough and pointy. This is after 10 weeks of alkaline eating while healing a femur that shattered from a minor fall plus “having the bones of a 90 year old”. Stay Tuned. Wow, Jean – you have tangible proof that your body pH is becoming more alkaline thanks to your diet. Please keep us updated, and I wish you a speedy fracture recovery! I always had and still have very strong nails……..many people don’t believe they are real………super strong., yet i have osteoporosis for the last 3 years. So that nail comparison is certainly not for everyone. Valie, I’m so sorry. I have a DEXA in Sept 2017 & terrified of the results…. Excellent post. Keep posting such kind of information on your page.Im really impressed by it.Hello there, You’ve done a great job. I’ll certainly digg it andpersonally recommend to my friends. I am confidentthey will be benefited from this site. Vivian, I have a question about the relationship or possible interaction between your program and those with chronic kidney disease (CKD). Thanks, and I look forward to your reply. Is there an answer to this situation. The nails on my right hand are so strong they are hard to clip. But the nails on my left hand split and break easily and seem thin and fragile. What to do? Hi, I was delighted to find your website very day I had decided to do research on the web on what my fingernails were telling me. What a nice coincidence! I have multiple heavy metal toxicity and the metals sit on the cell’s receptor sites for absorbing minerals, so though i have a nutrient dense diet, including sources from B12 I can’t absorb the nutrients very well. I’ve just am going through more testing with a molecular biologist and a specialist. They say it’s important that lithium and B12 be balanced in the body in order to absorb B12 otherwise B12 can in long run deplete lithium levels. You may want to check out the online book by Dr. Amy Yasko. I have order several times the free kit how to prevent bone loss and I have not received anything in my e mail it is not in the spam either. I am afraid once I pay for your digital recepies book I will not get it either. I have yet to receive Stop The Bone Thieves.. I retrieved this post from mu junk mail box. Try looking there. I have severe adult-onset asthma which requires me to use an inhaled steroid as well as additional dosages of Prednisone about 4 time a year. I am 60 years old and had a good bone density screen 8 years ago. My last year’s screen was a -4.4 in my right hip. I have started your program – but what else can I do to counteract the effect of the steroids? I feel very helpless. I was put on Fosamax and after I read the side effects, I took myself off. I am not taking TrueOsteo and following all your plan – is there anything else that I can do? I have to breathe, so I just don’t know. I am “NOW” taking True Osteo. Kathy, have you tried the Buteyko breathing technique for your asthma? It is very effective and might help you to get away from those steroids all together. There is lots of information online and it can be taught via Skype if htere is nobody available nearby. i wana ask why my bones produce pooping sound whenever i stretch my elbow,shoulders everything .why this is happening i am just 20 year old and i am very tensed about it .i am doing a gym and this is common everyday it does not cause pain but this habit blowing me away .please help me regarding to this..
We grew up constantly hearing ” drink plenty of milk and build strong bones, drink up, drink, drink,drink”. Now we hear “oh they were wrong , if anything drinking a lot of milk is possibly harming your bones but no benefit whatsoever, zero”. With that being said it would be safe to assume whatever is recommended now will also be debunked as a myth in the next 10-20 years like most other medical advice. Not trying to be rude but to be perfectly honest I am sick of hearing all these endless newly discovered myths with the latest recommendations that always seem to eventually turn out to be just more BS. The best you can do is eat healthy, get plenty of exercise and yearly check ups and hopefully you won’t get ran over by a truck or diagnosed with cancer (caused by the latest miracle med for ????????? ) or a half million other possible fatal circumstances. Following the latest newly discovered advice seems to always turn into No don’t do that, it’s very harmful and could be fatal. OOps our mistake, sorry. Any advise to someone with osteopenia and just recently suffered kidney stones? Take a teaspoon of apple cider vinegar three time a week. You will never have a kidney stone. I read about research being carried out at the Ageing Bone Research Program at Sydney Medical School about a new medication for osteoporosis called picolinic acid (derived from the essential amino acid tryptophan). It is said to stimulate bone formation rather than stopping bone destruction. At the time I read the article it had only been tested on mice. Do you know anything about it? “In Sidney, Australia, medical school researchers are looking at picolinic acid as the next osteoporosis treatment. Derived from tryptophan (an amino acid found in foods like turkey and cheese), picolinic acid has been shown to increase bone formation rather than stop bone degradation. Is your program compatible with the Dr. David Perlmutter, Brain Maker program, to improve the microbes in your gut. He advocates foods that are fermented, avoiding gluten, and sugars. What’s amazing, Marlyn, is that bone-strengthening nutrition is also excellent for fingernails! I find it amazing that no one, not this md not anyone is mentioning that cows milk has been found to actually TAKE calcium from our bones. This is 2015 , if you all ate cheese and drank milk your whole lives why would any of you be having a problem. Shouldn’t you all have bones of steel? Because it’s not the simple David. The human body and the way it extracts, synthesises and populates out body with nutrients vitamins and minerals is not a simple process of “put it in mouth and it will go there”. Especially with things like calcium. Other factors come into play. So yes you can eat dairy all your life and have bones of glass. Thanks for all the information about nails and their indications. I have had ridged nails for as long as I can remember but they are very strong and grow well. I have osteoporosis (thanks also for your useful information) if that is a factor. My doctor suggested a multi-B vitamin, but I haven’t noticed any difference in the months I’ve been on that. Can anyone diagnose and suggest treatmen? I have a lot of white spots in some nails which split and break very easily. Some of my nails are worse than others, I keep then short, but are very worried. I took the bone density and have osteoporosis. I refuse to take Boniva (I think the name) which I understand is terrible medicine. I am presently taking bone strength Slim tables 3 times a day. The nails continue to keep breaking and breaking. My worst problem on my nails is my big toe nails being so thick i can’t cut them plus turning ingrowing and very painful. Hello! I have a couple questions. First is that I had a healthy tooth break recently and had to have it removed. The dentist said my tooth and jaw was dense. My tooth kept breaking while he was taking it out. He had to take out piece by piece. I’m recovering from it now and im feeling sensitivity on a couple other teeth now. I have no idea what is happening. My second question is that my 12 year old daughter has hypothyroidism and I was wondering what is the best way to get her the nutrients she needs other than eating healthy. I just want to make sure she is getting everything. She does have some ridges on nails. She has some other health issues as well but this is one of them. One thing at a time right? My last bone density scan – and several before that, indicated osteopenia, with density going either up or down a little bit between scans. The problem is that my last scan was well over 4-5 years ago. Now that I’ve had a bilateral hip replacement and have titanium hips, I’m told I can’t be scanned anymore. This is a heck of a thing! How in the world can people like me ever know what their density is? Thank you. I, too, have had both hips replaced with titanium. They can still do the scan. They scan your arms and back instead of the hip and back. I just had it done. I am so confused on what vitamins to take, my counts are terrible, I have a long life ahead of me, & my back hurts. I do have osteopenia. My nails are brittle, what nails I have, they are so soft. I was on fosamax since 2007, doctor took me off it yesterday. Please help. I have read that Fosamax does more harm than good so do not keep on having it especially if you are young and your Dr has said to go off it. My recent conversation with regard to my right ankle giving out, going to the chiropractor and finding out about inflammation in my right leg, etc. has nothing to do with nails. But I must add that I too have vertical ridges on my fingernails since this page is about reading your nails. I also have fungus on my right foot toes- the last 3 toes and about 5 years ago I had the nails removed in hopes of curing the fungus. The nails grew back and were rough and became thick. After this last 5 days of diarrhea and while writing this I am noticing that three of my fingernails on my right hand are almost smooth again. I am now wonder if my diarrhea has something to do with my nails improving. why can’t I bring up the replies?? this is the screen that comes up when clicking on REPLY to all the comments. i would like to read your replies to the comments before i make a comment. thank you. I have the NEW EXPANDED EDITION of Save our bones PROGRAM. I have not read all of this book but what I’ve read sounds like it has very valuable information. Must start over and read it through to the end. I am on bio-identicals estrodial 1 MG and progesterone 100 MG hormones. I am also on Nature Throid 2 Grain(130 mg). My reason for the hormones is to avoid osteoporosis. My alternative doctor prescribed the natural thyroid supplement. My regular doctor would like me to take Armour Thyroid prescription. Vivian , I would like your opinion or thoughts. My thyroid doctor told me that sometimes the organic thyroid meds well for the thyroid condition. How can I find out more? I developed osteoporosis after being put on thyroid medication. I complained of not being able to sleep. The doctor recommended sleep aids. My nails began getting brittle and curved. I started having pain in my back, wrists and leg. I was sent for an xray. The orthopedist said my bone density looked “off”. He sent me for a dexa which came back with osteopenia in my hips and osteoporosis in my spine. Evista has not helped. I started this program 6 months ago. My nails are much better and I no longer have the pain. I hope my bones are improving. The doctor will not admit that the thyroid medication was to blame, however, my endocrinologist took me off synthroid 2 years ago and I feel fine. I have been told I have osteoporosis in the “fracture zone” and have been given a prescription for Actonel (which is still in the bottom of my purse. I try to maintain a dairy free diet and have been taking calcium with vit D supplements. I exercise more than most people I know and still my osteoporosis is worse than 2 yrs ago. The note from Jean S re Nature Thyroid got my attention as I have Graves Disease and am required to take synthroid daily. I am wondering if the synthroid is leeching the calcium from my bones or possible preventing the absorption of the supplements. I would be very interested in any feedback and would also like to know where to find Nature Thyroid. Drinking Distilled water does not cause mineral depletion. That is an erroneous assumption based on one bad small study done decades ago that has since been disproven. People keep quoting this without realizing that the study was proven incorrect. It is amazing how bad information continues unquestioned for decades. Just because there are no minerals in distilled water doesn’t mean that minerals will be leeched from your bones. That is bad science. Could you please provide the author or source of the study on distilled water not causing mineral depletion? result was osteoporosis in my hip. I have been told I need to have another test to detect fracture risk and because my doctor is aware that I am not taking the Fosomax as prescribed. Although not perfect, I have been following your program for several years. Thank you for this program. In your answers of day 26 you have a link to Natures City and they have a long and very interesting article on AloeVera. I am interested in their product True Aloe MT. but when I tried To order their Special of 6 bottles I could not because their order form allows only orders to a few countries not to South Africa. Is it possible for you to help us in this matter as we would really like to try the True Aloe product. I am a very slim 58 year old with small bones, and yet my fingernails look extremely healthy – strong, pink and no white lines – definitely not brittle. I was told I have a 5% chance of fracture within 10 years. I wonder if I actually have osteoporosis at all?! I had a report of 2% chance of breaking a hip in ten years after being on Fosamax for several years. Two months later I broke my hip. So you are smart to keep up the program. Although my bones were showing good in a scan, I figure they must have been brittle from Fosamax, thyroid meds /disease and/or omeprazol, which I understand also leaches calcium. Naturopathic doctors by the name of Peter Glidden and Joel Wallach suggest that fosamax and other bisphosphenates actually put the natural process, which replaces old bone with new bone, to sleep. Which makes the dexa scan a waste of time, because, while bone density will look great, it’s nothing but old and dead bone. So, in essence, the dexa scan shows good bone density, but we could step off a kerb and our leg will snap in two. Why? Because its nothing but dead, dry bone with no flexibility or structural integrity. Makes sense. Google and listen to Drs Glidden and Wallach. Their knowledge base is incredibly well researched and has a genuine focus on the root cause of the problem and offers ways to reverse the process through simple mineral uptake which the body requires in order to heal itself. This website is really interesting. I am interested in going on the Save our Bones diet (I always thought that my diet was pretty good but never really thought about the alkaline/acid balance). I need to do something because my scan shows -3.1. My worry is that my bmi is only 19, I am naturally a slim person. Somebody did ask about weight and not wanting to lose any (a lot of people have talked about the ‘bonus’ of losing weight and it wouldn’t be a bonus to me). Nobody seems to talk about how you can avoid losing weight on the programme and I would be grateful if I could be reassured that you needn’t lose weight on the programme. Just stopped letrozole drug post breast cancer which is known to deplete calcium . I have osteopenia and have lost weight very petite slim . What is best calcium to take ?! First of all I want to thank you so much for all the information I have received from you. I am scheduled to do a bone denisty test soon. I believe that my test will show improvement in my bones. I received your book, and I have been use the information.l My doctor is looking at Prolia, he said if my bones have not improved. I do not think I will be doing Prolia. What do you think about this new Prolia? I will continue to do your regime. I have not seen anything that has proven after all these years, that Prolia( is newer) Boniva, fosamax, reclast (which is deadly), etc. has help rebuild bones.. After using Fosamax for 5 yrs , there is now proof your femur bone can snap while just standing at your kitchen sink..
Those drugs only wraps your bones (so to speak), and do not let your bones, rebuild new bone..
You might want to take a look at Strontium for your bones..that said, there are allot of vitamins to take for your bones. We cannot eat all the vits that we need..And calcium alone is Not the answer ..
Drs. only know what the Drug companies tell them.. In med school , they might get 4 hours of alternative to drugs..
Before you take any Osteo drugs, check them out, and not what your Dr. has to say..
Be proactive about your health. I’m another one with soft nails, so I look forward to y our comments about them. They break really easily – like, just tucking in the bed sheets – and I seem to have a perpetual small split in my thumbnails as they are always catching on things. I have your Books and very much value your informative research and information that you send out to the Osteoporosis Community. Letters from your readers are also interesting and confirm exactly the terrible effects of taking prescription medication. It is indeed a confronting diagnosis for many and naturally patients seek genuine assistance in treatment. Your research provides the opportunity to make an informed decision and I thank you for your committment, care and dedication from which we all benefit. Why are fingernails, and not toenails, subjected to this home test? My toe nails have issues but my fingernails are fine. Another good article Vivian. However, why no mention about dark streaks in the nails sometimes being an indicator of developing liver dysfunction? Hi Vivian,four months ago I had a thoracic spinal rupture(Spontaneous intracranial hypotension-cfl).I did 2 blood patches with the second procedure improved the CFL.My concern is how will the bones can repaired.I’m still having severe chest and back pains.At my age 55 yrs ,what are my chances of this happening? Is there a way to get email notifications of activity in this conversation? in whole milk and a little fruit juice. Can this flush the calcium out of my bones? Thanks for being a part of the community! Parasites are another cause of bone density decreases. 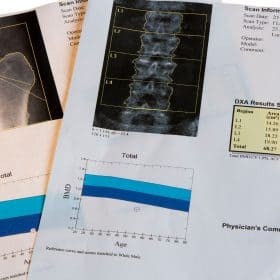 I had undiagnosed tapeworm and my bone density tests went from very good for my age to osteopenia levels in 12 months. Ah the nails .I have suffered for years with soft nails and dry hard cutles .bring tested next month for celiac disease …I stopped gluten food for 1month annails improved a 100%…have had to restart gluten foods so to confirm if I am celiac and my nails really bad again .split skin soft nails .if I am celiac I realise my body had not been absorbingvitiams and minerals…very interesting .also my nails are so soft I don’t to cug I can just break them off myself .as always Vivian thank for your most informative article . My fingernails tend to be soft. I take BioSil drops for silica which does make them harder. I would appreciate learning why fingernails can be soft? Does this correlate to weak bone strength or poor density? Thank you for all your interesting articles. They are very helpful and it is comforting to know that I am not alone in the uphill process of building new bone. I too have brittle nails which seem to be taking forever to repair. So will try changing my brand of calcium to an algae based one, I should have done this when I read the first article on calcium. I’m taking B vitamins, zinc, magnesium, omega 3, boron and K but have just realized no longer take Primrose oil which I used to do – maybe I should re-introduce Primrose oil? I had been diagnosed with osteoporosis at the age of 47 and I had a terrible doctor who did not tell me what I should do. I am now 52, with a new doctor who send me for a second bone scan and found that my osteoporosis has become worse, to -3.6 which she said is very high. She gave me a prescription of Alendroni Acid which I took only twice and don’t want to take anymore as I am scared and I felt terrible. I just oredered your programme and I am very hopeful that you are telling the truth and that you are a real person and not a marketing company, that would be devasting as I am desperate to find a cure for osteoporosis. My doctor said if I don’t take Alendronic Acid I will for sure have a fracture, in the hip or spine. I am terrified and I look forward to follow your programme with hope that you are real and you offer a real solution. I thank you and I will let you know my progress on this web site which I find intersting but a bit too agressive on the sale aspect! Thank you very much for giving me hope, I hope I will not be disappointed. God bless. Giovanna. I look forward to do your programme. resulted from the bone scan I have just done. terrified that my condition is already very serious. Thank you very much for giving me hope! Would love to hear how Giovanna is doing now! My nails are strong and healthy and my bones keep getting worse and worse. Alas! I have had a DXA scan recently and the bone mass density in my spine had not got worse – minus 2.l so I was delighted. I take chewable calcium tablets, Adcal-D3 calcium carbonate plus D3,(on prescription), once daily; liquid glucosamine l,500mg Activjuice for Joints and fish oil or linseed oil. Although the Adcal contains additives (sucrose and soya oil as well as artificial flavouring) it has helped as explained and the other supplements have helped control osteoarthritis in my knees and ankles, etc. I have also found Osteocare tablets good although expensive and difficult to swallow, although it is possible to get a chewable variety. I recently was told by an osteopathic doctor that the best exercise to increase bone density was jumping on a trampoline. Is this true? I had already learnt that white flecks on fingernails also vertical ridges indicated a lack of calcium but have found my own fingernails have become more ‘ridgy’ as I aged. Perhaps this is inevitable? I do not have the white flecks. Your fingernails are just a window into your health, and ridges or other appearance issues can have many possible causes. If you’re concerned, have a health practitioner take a look. Thank you very much for the information. I used your book as my reference when I am in doubt. My family doctor never recommend me a bone density test. Five years ago I was diagnosed with osteoporosis and I started eating vegetables rich in calcium and avoided red meat. I exercised daily too. I think I am okay cause I did not have any fractures inspite of my falls. I boiled water for drinking. Thank you for your research. Still anxious to find out your idea on “ganoderma”, used in coffee to balance the ph. Have you heard of this? Hmm… A trampoline? Probably not the best although fun. Impact is the thing, but do not go for English rugby or American football. Sitting on your washing machine if it vibrates a lot in spin mode is good! Hard soles that clatter as you walk is another, although this may annoy everyone else. Weight bearing in short bursts is another. In short brief stressing is the order of the day. But Vivian knows more about this than me for people who are at the ‘chicken bone’ stage and are now engaged in getting to the ‘turkey bone’ stage. I have a dark line on my big toe nail. I wonder what that means? Wow! I have seen an improvement in my formerly brittle nails since I have been on the program and I was wondering if the improvement had to do with my changes in diet and supplements. They rarely break or chip any more and are generally stronger and better looking! I am not a tee-totaler on the diet, but I am probably at 50% compliance and I have switched calcium supplements. I used to take calcium carbonate and now I take an algae-based calcium. Thank you, Vivian! hope. I am exercising more, and that helps, too. I just had a bone density test, and the results are encouraging. No changes in the last year. Thank you for your dedication to the Osteoporosis Reversal Program. Vivian,I have acrylic nails; could this same method work on toenails? Vivian, I thoroughly enjoy reading all your comments on health and exercise and what is best for us all. It was very interesting to hear about what we can see is wrong with us, just by looking at our nails. You really are a ‘star’ giving us all so much of your time.It is very much appreciated. Although the article on fingernail health is a good general nail health article it fails to mention that those people with Graves Disease, after iodene radiation and normal thyroid hormone levels, will not regain normal strong healthy nails in all cases. The eye disease which accompanies Graves Disease and the nail condition can continue on even when Graves Disease has been diagnosed and treated. So do not be discouraged if you are following a healthy alkaline diet and you do not see improvements in you finger nail health if you have or have had Graves Diesease. not sure, my diet can increase my bones density. Thank you. Hi Vivian, Thanks for the article on Nails. My nails are the best they have ever been but still have a way to go with the length-wise (vertical) ridges Not bad since I turn 65 at the end of thid year! There is always hope. I too have RSD and it can affect your fingernails in several ways. It can also affect your bones. This is a excruciatingly painful condition that there is no cure for. I pray for your friend. Ohmigosh! Fingernail lines! Yes. I just spent two hours doing an internet search on longitudinal lines on my nails. I’m 70 and this is a new problem. I know I sometimes forget to take my calcium and slow to get back to active life after an illness but this is going the wrong way. I’m taking the three of the CostCo oyster shell Ca ++ 500 MG with 400 IU of Vitamin D. Should I change the type? I know you went over this in the “kit” but I can’t put my hand on my materials right now. I also take fish oil, Vit E, glucosamine, and a “drugstore” multivitamin. For almost 10 years I used every product on the market. My blood calcium was ok, but I could not get my Vitamin D any higher than 23. It should be over 30 at least to get the calcium into your bones. Nothing worked for me until I found Natures Bounty Vitamin D in a liquid softgel that comes in 1,000; 2,000; or 5,000 IU’s. They also have liquid filled absorbable calcium softgels. 2 gels have 1200 mg’s of calcium and 1,000 IU’s of Vitamin D.
I take 5000 IU”S of Vitamin D every day. My vitamin D level finally came up to the 50’s. I also take 1200 mg’s of Calcium daily. The Nature’s Bounty works really well. Where do you find Nature’s Bounty supplements? A wonderful company that sells many brands of vitamins plus many organic nuts and seeds. I to want to know where to bet Naure Bounty Vitamins. This info is for barbgarrison. You can find Natures Bounty products at most grocery stores, CVS and Walgreens pharmacies. You can save money by using coupons from the newspaper ads and from the pharmacies. I’ve been using N.B. fish oil and other supplements for years. Many thanks Vivian for all your informtive articles and especially for drawing our atteniton to our nails. Several writers asked about horizontal lines in nails. These lines are not white. Kindly explain the emaning of this condition in one of your caring letters. Thanks so much, Vivian, for posting the article about the connection with our nails and Osteoporosis. I used to have nice nails, but for the past few years, I have noticed them getting very weak, and curving or some bending under at the end. Now I know why, and what to do about it. Thanks so much, for all of your valuble information! I have been on to you before you may remember I am a hemipelvectomy amputee living in Ireland.I have just had my swcond Dexa Scan and am pleased to report a big improvement my hip gone from -2.60 to -2.00 and my spine from -1.5 to-1.3 without the drugs.I am also pleased to read your artical about the nails as I live in Ireland. Thanks Vivian, Your articles are always interesting and informative. Thank you for this great informative article on nails. I have lots and lots of ridges along my nails, however they’re not white, and the nails themselves aren’t brittle and don’t split. So in spite of the detailed information – I can’t tell what’s my bone situation. i have the same question as shula, interested in the reply, also have u got this programme in spanish languagesince i have many sisters interested but do not read the english lang. Hi Yeh I have the same thing my nails seems really hard & thick & I only have vertical ridges on a few of them, I take Caltrate Plus & ostevit-D, Daily. I still worry every day about my osteo as I was told I had it at 40 yrs old. i keep reading that milk is not good for our bones. i drink 1% every morning with my cereal which i really enjoy,so now i’ve tried soy milk which isn’t bad especially the flavored ones,i even tried almond and rice milk which i don’t like,so now i’m back to 1% milk..What do you recommend? Stay away from the Soya – not good at all. To be honest a bit of milk is ok but not a lot. For instance in tea, although the anti oxidant efficacy is reduced. Strong tea has loads so not too much to worry about there. Some Greek physician whose name esacpes me said it all “The poison is in the dose” meaning that many ‘bad for you’ things are only bad for you at certain levels. For instance a bit of salt is good. A lot is not. However, Soya products are less healthy than some think as are vegetable oils. Olive oil is fine for instance but many vegetable margarines are much less healthy than butter. Thank you for this helpful information. How does hypothyroidism fit into this equation? I take Armour Thyroid and I cannot seem to get off it and my doctor told me that if we increase the dosage, it will rob my bones. I am in your save bones program, but still do not have restored nails. Any advice? Thank you for giving us hope. I’ll start here: Lumbar spine: T score is -2.1. Someone please tell me – where do I begin with the program?? It all seems so overwhelming! Don’t be overwhelmed. You can do it. Get the book, read and study it, read the website and do the best you can. For the others who are still drinking cows milk or taking any of those inorganic calcium supplements, etc., your questions are all answered all ready. Vivian, I too have wondered about your emphasis on distilled water. I have your soft bound book but, when I have discussed your reasoning for distilled water with homeopathic practitioners, they have strongly disagreed. This has kept me in limbo as I do NOT want to lose more mineral density. Please clarify for us your research on this very unique approach to the water type we drink. Thanks! Hi Alana – Please see my reply to Jacqueline. reverse osmosis filters have just been put on our drinking water tap and i have been led to believe this is the way to go with water – my naturopath recommended it to me…..
Our naturopath also said reverse osmosis drinking water was the way to go & suggested a portable countertop type of reverse osmosis filter if we didn’t want to go to all the trouble & expense of the under sink installation. (It cost approx $220 from the U.S. We also boughta fairly large glass container at the water depot & fill up with their reverse osmosis water each week (which our naturopath tested in their LAB to make sure the source was legit – you should be able to see how & where their water is coming from (otherwise it may be just plain tap water) so ask to see their source first before you pay to fill up! The distilling water machines are both expensive (over $700) and not practical because they can hardly keep up with your water demand! I have the NEW EXPANDED EDITION of Save our bones PROGRAM. I have not read all of this book but what I’ve read sounds like it has very valuable information. Must start over and read it through to the end. I am on bio-identicals estrodial 1 MG and progesterone 100 MG hormones. I am also on Nature Throid 2 Grain(130 mg). My reason for the hormones is to avoid osteoporosis. My alternative doctor prescribed the natural thyroid supplement. My regular doctor would like me to take Armour Thyroid prescription. Vivian , I would like your opinion or thoughts.I must say, I’ve been on many supplements as well and now I have a weak right ankle,have fallen and now am going to a chiropractor and she is treating me for inflammation on each side of my right leg all the way up to my right dimple of my backside. I believe the inflammation is in the soft tissue. I have felt soreness when I would push the outside area of right knee and upward but never imagined it could be related to the area on my right side just above my buttocks at the right dimple. I also have diarrhea and had a packaged salad mix the night before going to chiropractor five days ago, and have not been able to stop the watery diarrhea. Was eating saltine crackers and drinking Gatorade . Am now on ginger ale, black tea, and saltine crackers after speaking with a pharmacist. Today I had some plain Oiko yogurt, 0% fat. I don’t know if I have a virus or not. I don’t get flu shots. And I don’t feel sick. I have reverse osmosis fitted – what a boon. No more being stuffed to the gills with all manner of garbage. Keeps my cooking utensils free from scale as a side benefit as well. Much better than distilling for cost. That would be really great about fingernail testing. For now the jury’s still out for me. I’m scheduled to have a DEXA in the next month. I’ve been trying to stay on a healthy bone-diet for the last three years. Took Fasomax for about two or three years and then stopped — been off it for about two years. Hoping for a dexa with improved numbers because of the diet. Keep us posted. What is the rationale for drinking distilled water for the Save Our Bones program? I have been told repeatedly by holistic care practitioners that distilled water strips away minerals our bodies need. Thanks. One of the main functions of water is hydration. But water is also a great cleanser of toxins. Like rainwater, distilled water is pure – two hydrogens for each oxygen (H2O). Distilled water helps the body get rid of the minerals that your cells cannot use. In other words, it only collects minerals that have already been rejected or excreted by the cells. Once you add a few drops of fresh lemon juice before drinking it, distilled water becomes negatively charged. Toxic acidic residue is positively charged, and since opposites attract, distilled water with lemon juice is a powerful detox and alkalizing drink. Hi Jacqueline, I use only distilled water ( or rainwater from out in the country) mainly because I do not want to take in all the inorganic stuff as well as chlorine and fluoride that is in our tap water! The body has to get rid of it and could be ‘damaged’in the process. Now there are organic minerals you can buy and mix into the distilled water. Today I got the results of my BMD test. I have made progress but the progress is only +.1 and +.2 on both my spine and femur from where it had been (-2.4 – Spine, -2.7 Femur currently up from -2.5 and -2.9 respectively). I am still well in the negative ranges and would like to improve. I’ve been on the Saveourbones diet for 2 years balancing Acidifying and Alkalinizing foods according to this diet plan. I drink distilled water. I do confess that at times I eat other things because this diet leaves me so hungry. When I get too hungry I crash from low blood sugar levels – a diagnosed condition. I do my best to stick with it but there are times when I can’t. I have made sure I eat the high glycemic items listed in the Alkalanizing column to balance the Acidifying foods but I still get hungry as I am a very active person. I’m not sure what to do to avoid eating somthing Acidifying that keeps the weight and sugar levels up. I am not skinny but I am no where near overweight and people think I am much younger looking at my physique. I do not have a medical condition that makes me lose weight but stiking strictly with this diet makes me lose weight. Also, I have trouble getting access to many foods on the list where I live. I get bored eating the same old but I do it any way. Then to not have better results than I was hoping for is a bummer. I spend a lot of time on food prep in order to each according to this diet – means packing lunches and dinners – and have a crazy schedule as I am a parent, a wife, and a full time student at the age of 56. Any fresh ideas out there as to a remedy to this situation? I need to gain weight. How can I do that on this diet? Thanks. They have a very helpful utube video. It involves preparing a lot of food for the week. It is well worth a look. My working daughter found it very helpful too. In my opinion, taking the time for food preparation is paying it off; you will not lose more weght and also you will not be overweight, you are fine; keep doing the hard work, not matter what. WOW! I have had a white line on my big toe for last few years. Have been filing it down, didn’t relate it to my bones. Was diagnosed in Nov. 2010, have been taking supplements, eating better and the new nail growth no longer has the white line, I just took my shoe off and checked after reading your article. THANK YOU! THANK YOU! How safe is the Reclast Infusion Treatment for strengthening your bones? I appreciate your help and advice. I have your book and have been following your advice for two years. My foot cramping (a sign of calcium deficiency) has improved, but I have failed to acheive an alkaline ph and I still have vertical ridges in all finger nails, although they are not white, but some are a darker color, and the tips peel. I take a multiple vitamin, 5-6 Garden of Life Raw calcium, a fish oil and a gloucosimine chondroitin MSM, drink distilled water (8 glasses a day) and hike 6-8 miles in the local mountains Although a Jones fracture (5th metatarsil) two years ago put me out of regular strenuous martial arts 4 nights a week, I have been a pro athelete in several sports and have a dance background. I am fit and adgile, but petite and very small boned. Should I swithch to Algae Cal? What more can I do? I would never have taken bisphosponates and am appauled at how little my dentists know, after having had two teeth removed in recent years and jaw bone loss. My bone doctor threw up his hands and walked out of the office during what I thought was a civilized discussion on diet versus bisphosphonates. I have your book and get your emails, Vivian, and am very happy to be acquainted with you. Really appreciate your work. I have osteoporosis but have good teeth & nails (and am doing all I can to keep them that way). Have had 2 infusions of Reclast. I know I know. I’m thinking of adding “AlgaeCal Plus and Strontium Boost Now” to my regimen. Would like to hear any comments from anyone about this. pH values fluctuate throughout the day, so it is quite possible that you reach ideal pH levels (6.3 roughly for saliva and urine) throughout the day and aren’t aware of it. If you’re checking first morning saliva or urine, you might want to have a 100% alkalizing snack before bedtime and drink plenty of water w/ lemon juice to cleanse throughout the day. As far as your nails, you can try some whey protein isolate or concentrate (around 15 to 20 grams/ day). It is highly alkalizing and nails are made of protein. I have been diagnosed with osteoporosis but do not take any medication for it, but adhere to a healthy diet and exercise. I do however have vertical ridges on my nails, as did my mother who was diagnosed with ostelpororsis, but my nails do not split along those ridges. Any comment on what that might be? I was diagnosed with osteoporosis early last year but didn’t take any medicine,I’m just taking some calcium & vitamin d,I’m sure this is not enough with my poor diet.I’m so worried about my health and not sure where to start.Is your book available here in Australia?I asked in some book shops but they never heard of it.I really admire your strength and determination, I Hope I would have the courage and the ability to make a complete change of my life style that accompanied me my whole life. whether this will help the nail problem as well. I would appreciate your advice please. What is the TSH test? This lady needs to go to an endocrinologist! I too had nail problems, vertical line, splitting and brittle. I was advised to take Silcea and have found my nails are really getting strong and hard. My question is, if it does that for my nails, is it also good for increasing my bone density, along with, of course the 80 – 20 ratio of alkaline vs. acidic foods. I do not do well with calcium suplements but do take magnesium. I too had nail problems, vertical line, splitting and brittle. I was advised to take Silcea and have found my nails are really getting strong and hard. My question is, if it does that for my nails, is it also good for increasing my bone density, along with, of course the 80 – 20 ratio of alkaline vs.
opinion would be appreciated please. and for no other reason that i feel healthier and a bonus of weight loss was fantastic. I am confused. I have switched over to distilled water. Previously I was drinking 8 glasses of tap water daily. My naturopath doctor has told me that distilled water will hasten mineral depletion in my body.Your book has not yet arrived and I’m hoping that it will help me to understand the distilled water component of your program. The indicators of nail health is interesting but doesn’t cover my problem. My nails have a tendency to split (a few mm. )horizontally below the level at which they can be cut. Any idea what that indicates please? No, but if you find out please let me know. To say “I Knew That” really makes me a dunce… I did know this and have often commented to my friend Tina, the nurse about nails telling a story about overall body health. Two years ago, I had my nails replaced with false ones. After about eight months I couldn’t stand it and had them removed. It took over one year for my nails to begin to return. I went to two or three Nails specialist and asked for help. They just wanted to replace my nails with Fakes ones again. I knew something was wrong with my nails not growing. I can’t understand why I never went to a doctor, because I knew about Nail Health and that they are an indicators of many health problems which you mentioned and some I headed, like I knew about lack of B12 and poor nail quality. I new about Anemia and poor nail coloring. The short time I have been doing Vivian’s “Osteoporosis Reversal Program” I am seeing my nails start to grow. I see pink coloring under my nails and an eighth of an inch of white crest growth on the end of each finger. Thank you for your newsy article on Nail Health..I was glad to hear that if we pay attention to our outside health,we can learn something important about our inside health. Thanks again and you bet I’ll be rating my nail health on a daily bases!It will be my indicator of “Calcium Absorption” in this program I’m learning so much more about my physical health. Yes, Vivian, we could not forget about Japan even we wanted to – and we all feel for them and pray for them (and mankind). Thank you for the new information (and the exciting news of a new method to test bone density)! That would be great – hope it will be “in operation” soon. Is a supplement such as “Osteo Bi-Flex” worth taking? It is 1500mg of Glucosomine, 1350mg of “Joint Shield” and 1250mg of Chondrotin/MSM Complex. I have been taking it for several years and I think it helps flexability. Any feedback on this product? Whether these supplements work varies by person. I understand that the molecules are rather large and that not everyone can absorb them. European studies have gotten different test results on glucosamine supplements than US studies. The supplements were considered effective in the European studies and inconclusive on the US studies. I think this is because the Europeans studied glucosamine sulfate and the US studied glucosamine HCL. I take glucosamine sulfate 750 mg twice a day. I take it to help my knee joints. Without it my knees ache and make a clunking sound as I go up stairs. After taking glucosamine sulfate version for a couple years, I switched to glucosamine HCL for ease of availability and cost. It did not work for me! My symptoms returned. After switching back to glucosamine sulfate, it worked again. Unfortunately for me, most of my area (Maryland) grocery stores have stopped carrying the sulfate version. The supplement you reference includes glucosamine HCL, so it would not be effective for me. Once again valuable information you have provided. It is very much appreciated. Thanks for all the hard work you do. For 5 years, I was told that my brittle nails were the result of washing my hands and handling paper frequently i.e., the occupational hazard of being a preschool teacher. Since beginning your program, my nails have improved dramatically. The most consistent change I have made is drinking distilled water, but I also try to maintain an 80/20 ratio of alkaline/acidic foods in my diet. Your website has been valuable beyond belief. I’m anxious to see the results of my next bone density scan in January 2012! Thanks so very much Vivian! I also was having the problem of brittle nails and thought it was due to washing hands too much and using strong detergents. I began taking evening Primrose oil and within 3-4 weeks saw a marked improvement. It also depends on the brand. One time I switched to another brand because it was cheaper and within another 3-4 weeks the nails began getting brittle. Thank You VERY MUCH For Telling Us How We Can Test Our Bones At Home! So very very true. For the past two or three years, I had one nail that a white line in it and it kept splitting so that I could not keep it anywhere above the finger. I know that I have low bone density, and I have been advised to go on drugs to increase it. I have read extensively abut all of this, and then I came upon your programme, and probably, at the same time Algae-Cal. Before that I was taking Calcium Supplements which (of course)did not help at all. I take Vitamin D, K etc. etc., but the most appreciated thing that has happened is that I no longer have a white line in my fingernail, and it does not split. Keep up the excellent work. You are definitely a valuable resource for all females who are advised by ill-informed Doctors to go on Bisphosphonates (chemical toxins). Thank you so much, and I thoroughly enjoy every bit of advice that I get from this Website.